Scientific research. My main goal is to sample the microplastic in the ocean along our route. We will use a trawl, or net, that gets pulled along the surface of the ocean for a recorded time and distance. We will do this one to three times per day. The net collects plastic fragments that are 333 micrometers or larger. Then we count the plastic fragments and can calculate their density along that sample path in the ocean. I will also do some additional particle size distribution work and identification of resins. Our data will add to the global database of marine debris begun by our collaborators, Sea Education Association and 5 Gyres. The mobile app, Marine Debris Tracker, that I co-developed. The app will allow us to collect data on our microplastic sample locations and paths, as well as when we observe macrodebris (any debris we see floating on the ocean surface). We will take turns observing the ocean systematically while sailing (same station from the boat for timed periods) to note when we see floating debris. The Marine Debris Tracker data will be uploaded into the active website for viewing every 24 hours, so you can see all of the sampling work we have completed and all of the floating plastic debris we have found. Where does our garbage go? Waste management is so often unseen… And where do small islands put their trash? In both of our port countries and cities, Lanzarote to start, and Martinique to end, I will be doing solid waste management assessments. I will be exploring the methods of waste management on these small islands, recycling capacity, collection methods, and disposal. I will be interviewing people willing to talk about the unique situation of dealing with waste management, and specifically plastic waste management in an island setting. I will document the findings with interviews, photographs and quantitative data. My goal is to build awareness of the problem and to the connection of waste management and marine debris. Citizen Science. We will be teaching other vessels on the UNESCO Atlantic Odyssey about Marine Debris Tracker so these citizens can also contribute data to the global database. Some people in the Odyssey are already conducting citizen science as they help to release buoys that will provide ocean current data to global research efforts. With Marine Debris Tracker, they will also be able to tell us when they see marine debris or litter. Pushing limits, growing. Any scientific open ocean voyage is an opportunity to get back into the field and conduct hands-on research. I don’t get to do that as often in my role as an assistant professor any more. This is a unique opportunity to conduct research first-hand. In addition, I will help in other working roles on the boat, including sailing. While science and engineering are my passions and I can pass that on to others, I expect to learn from the passionate sailors on board just how we get this vessel across the ocean. I also can’t wait to check out the engineering on the ship – energy (solar, wind), water supply, wastewater, and waste management in our little microcosm will be interesting. Engagement in STEAM (science technology engineering mathematics + art). Studies show that we are better off with a diverse community of scientists studying problems, but women are still lacking in the workforce, and especially in engineering. An all-women crew of diverse ages, backgrounds, etc. shows girls and women that anyone can do this. I went into environmental engineering in college because I cared about the environment… I didn’t even really quite understand what engineering was at the time. And there were many instances where I was challenged to work well beyond what I thought I could do, but I never gave up. And then I became completely fascinated by waste: quantities, qualities, management, and it’s very intense and complex relationship with people. I love that I can work on global issues, like waste management and plastic in our oceans. It is my hope that girls and boys will see what we do and think “I could do that too.” Because, they can! Toxics in our environment. This is where it gets a bit personal too, although we study some of both eco- and human-toxicology in environmental engineering. We personally limit our family’s exposure to pesticides, hormones and antibiotics in food. We limit plastic and other products with our family that could release BPA or phthalates. Cancer, often caused by a combination of genetics and exposure, has touched many of my family and friends. Two of my closest woman mentors in my family passed away from cancer: my step mother from brain cancer and my cousin from breast cancer. Friends younger than I have been diagnosed with breast cancer. There are countless more people I know that have either succumbed to or beat cancer. While exposure to toxics is not the only cause, it certainly can contribute. And, while some people choose to put some toxics into their bodies, when people are unaware of them in items they use or in their environment, it is not a choice. Becoming aware empowers people to take more control over what they are exposed to. I dedicate this voyage to my step mom and my cousin and to all those that have passed on, been touched by, or are battling cancer right now. My family. When I got the message about this opportunity, I forwarded it to my husband, since we are partners in life and especially in parenting right now. He called me in less than 2 seconds to say, “You need to do this!” Even though we have two young boys (age 6 and under), and our days and nights are adventurous, to say the least, he is willing to take all that on while I am gone for me to be able to do this work. And I would do the same for him – we both support each other in our gifts and callings in life. My boys, who don’t quite understand the time frame yet but say they will miss me while I am gone, want me to bring back fossilized Megalodon teeth(!). They both think mommy is going on a great adventure though. I am connecting with my older son’s class at school so they can follow the journey and learn about marine debris. My younger son is talking about how our hearts are forever connected no matter where we are. I have the best family and I love them all so much! We set sail November 16. You can follow the live ship track here. And check out the Marine Debris Tracker website map to see where we sample. I’ll be posting blog posts to the eXXpedition site and here as well. This entry was posted in Apps, Marine Debris, Publicity, Research Group Updates. Bookmark the permalink. 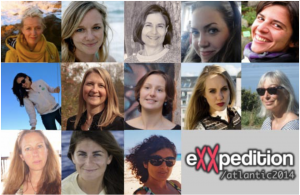 One Response to Why eXXpedition 2014?